Blame Bernie Sanders: Man to Ride Unicycle from Vermont to D.C.
Let's see the Koch brothers try this. 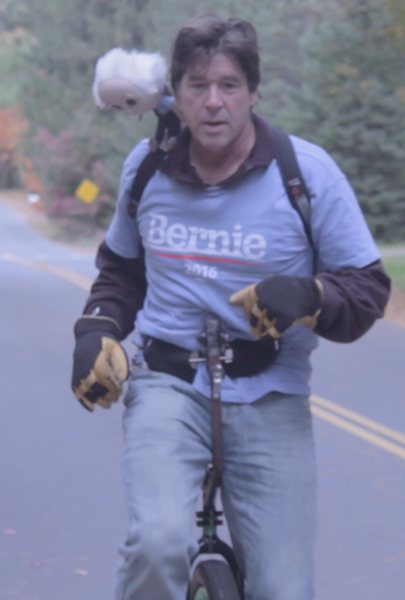 At 9 a.m. Sunday — one year before Election Day 2016 — Shutesbury, Mass., resident Peter Corbett will set out from Burlington on his unicycle and start pedaling toward the White House, 550 miles away, in hope of raising money for Bernie Sanders' presidential campaign, he says. "1 Wheel, 1 Nation, Government 4 All," he's dubbed the effort. Corbett, 57, a Burlington native, plans to cover 25 miles a day and arrive in D.C. during the first weekend in December. He's hoping to raise money from curious passersby and internet fans, and be joined on the road by people using cars, motorcycles, unicycles, "fast pogo sticks" and whatever else they can use to keep up. Because this idea isn't weird enough, apparently, Corbett plans to bring along a Bernie Sanders doll — Lil' Bernie, a runaway Bernie swag hit made near Corbett's hometown — and wear it on his shoulder, pirate-with-a-parrot style. Corbett launched a website to help you follow his progress and fork over some cash. Corbett says he grew up delivering the Burlington Free Press on his unicycle, but, like so many of us, discarded his childhood passions as he reached adulthood. He graduated from the University of Vermont in 1980. He passed on a gig at fledgling ice cream shop Ben and Jerry's to work as a community organizer, and helped rally neighborhood groups to vote for Sanders during his mayoral campaigns. He later worked alongside Jane Sanders at the King Street Youth Center before moving to Massachusetts. In recent years — in part to teach his two children the virtues of persistence — Corbett hopped back on his dusty unicycle and rode it 190 miles in the Pan-Mass Challenge, a ride across the Bay State to raise money for cancer research. Corbett said he declared himself retired from long unicycle rides in 2013. But a couple of months ago, he said, inspiration hit. In recent weeks, he has been working out and researching average November snowfall totals in Vermont and New York. He even taught himself to use iMovie, to create the video seen above, though he experienced a temporary setback when he spilled a glass of wine on his computer. Corbett said he tried to reach out to the independent Vermont senator's campaign staff to get their backing for his idea, but he didn't get very far. "I think they will see it's cool by the time I get to D.C.," he said. "They've got a month to think about it."